Hey everyone. 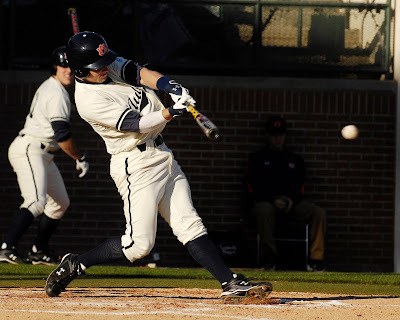 Auburn baseball resumes its postseason path this evening against Tennessee, which could be a very significant series. Two wins means Les Tigres automatically qualify for the SEC Tournament. Insiders refer to this event simply as "Hoover" based on its location, as if they're totally familiar with the place. I still need GPS. It's been six years since I rolled into the Hoover Met. Can Auburn (33-16, 15-9) win two this weekend? You betcha. Tennessee is 27-21 overall and 11-13 in conference games. The Tigers swept Mississippi State last weekend, which tells me they mean business. They have won five consecutive SEC games overall. Cory Luckie, Prattville native, goes tonight for Auburn. The game starts at 6:30 p.m.
You know, sometimes I can't understand what michael is trying to say. I saw a lot of ball players and fans as I was out and about in the shopping areas of town yesterday. I even saw a red Eufaula Tigers shirt with tiger eyes amazingly like AU's. Just didn't look right--the color, not the eyes. Our brother Michael can be hard to understand. Bo & Coach Chiz beat Jay Barker & Anthony Grant in the putting competition at the Regions tournament yesterday. They were also victorious in the unscheduled bare-knuckled boxing "competition" that followed. I'm all for Auburn beating Tennessee in anything. I expect a full report from Taylor at some point during the next 24 hours. I'm quite happy living the life of a 21 year old bachelor at this point. Not gonna lie though, should I propose to a girl in the near future I'll need some beer to help it pass. re: Michael... I think it's his grocery list. What a coincidence... we're having some a4tq3 tonight for dinner. It seems that all the big three mens sports are on the rise at Auburn. It is good to see. Maybe Jacobs isn't a bad athletic director. You're having beets for dinner, THT? I thought you didn't like vegetables. I'll bet you didn't know that I'm fluent in alfghao;e4h. Don't doubt the brilliance of Michael. I figured out his strategy a while back. He is developing a market for his new Michael decoder ring, which should be available on line in the near future. Got my tickets for Sat! Gonna be hot in the sun but it will be worth it for a win! Taylor, what a thoughtful proposal with pictures for her birthday. I'm praying for a rainless evening for you in Dallas. Jet, funny stories on the previous thread. Hope we sweep the Vols! I wish I lived close enough to Auburn to go check out a baseball game. Maybe one day I will be lucky enough to own a condo down there like someone else we know that hangs out around here. Headed over to AU about 5 tonight for the game. Got 2 tixs for Saturday also. Hope I can make that one. Not sure I want to sit in the heat though. SteveFC is right. The Michael Decoder Ring should be out by 2016. Our nation's best scientists are currently working on it. Well, rats. I thought we were having beeves for dinner, not beets. I ate beets when I was a kid. I grew out of that bad behavior. Michael, so your decoder ring will be the only thing that survives 2012? I don't want to get too far into, but we actually plan on harnessing the destructive power of 2012 in the ring. It is complicated. We will use magnets and aluminum foil and duct tap and stuff like that. It will basically save the world and become really awesome. And better yet, it will translate my nonsense posts. I might make the Sunday baseball game. Hopefully the drama of making Hoover will be resolved prior to that point. Spoken like a true insider API. I just realized I am scheduled to work 24 straight hours on sunday/monday. I probably need to figure out how to avoid this. That's just a general comment, not directed at anyone or any particular post. Don't you people know how heavily I rely on you to keep me entertained throughout the day? So far, I'm not very entertained. Now I feel I have no choice but to leave this place soon then do some yardwork shortly after I get home. I hope you're happy. SFC should b jealous. I'm sitting in the BEMC at graduation. the COO of Apple just spoke. I think he is a 1982 AU grad. we all have to wait until 2016 to find out all michael has been saying is: be sure and drink your ovaltine. Norm, perhaps you're the one with the bad attitude. I sent you something entirely humorous today. Yet, you still have pout. Get over it. Being confused with FSJ. Will I ever live this down? it's August.... where's Dear Leader?